Motocross incorporates bright colors with various patterns and designs throughout its gear. 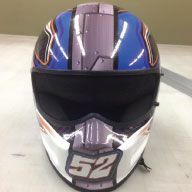 Motocross and ATV helmets is a service that we cater to by delivering a design wrap customized for the rider. The design will adhere to the helmet allowing for a smooth finished and polished look. Quality Signs and Banners will apply the graphics onto the helmets or gear by precise placement in order to deliver the final product.